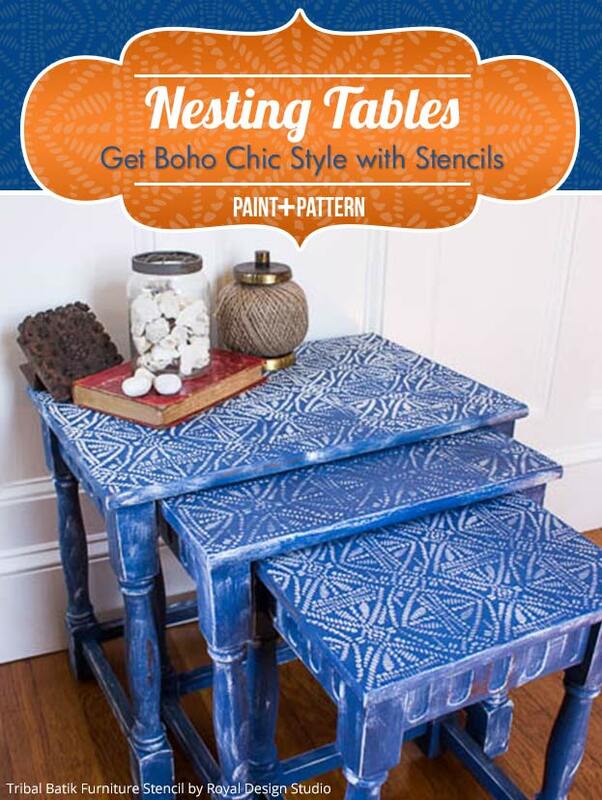 Nesting tables are one of the greatest purchases for a home, especially for a small living space. While entertaining, you can simply spread the tables to get more usable surface area and later push them together to make room. As much as I love my nesting tables, they desperately needed a little bit of personality. 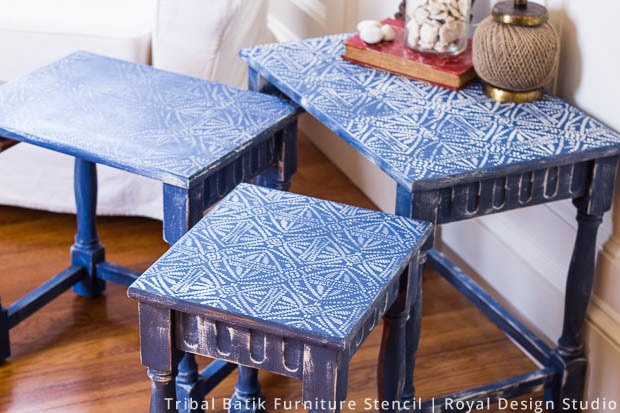 I decided to give them a fresh new look with Royal Design Studio’s Batik stencil pattern in Napoleonic Blue Chalk Paint® by Annie Sloan. 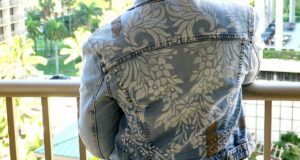 The beautiful boho chic inlay-like look of this pattern would be a perfect addition to any home. So, let’s jump right in. A little dated and the wood was worn in areas, making it the perfect type of furniture to paint. Mineral Spirits and Denatured Alcohol for cleaning. 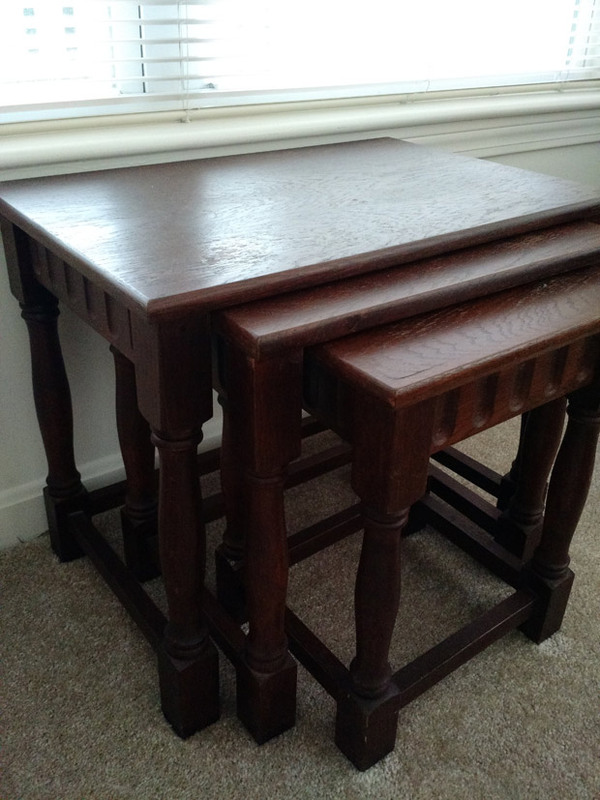 Prep furniture before painting: scuff sand the surface, wash down with mineral spirits followed by denatured alcohol and finally rinse with water. Allow to dry. 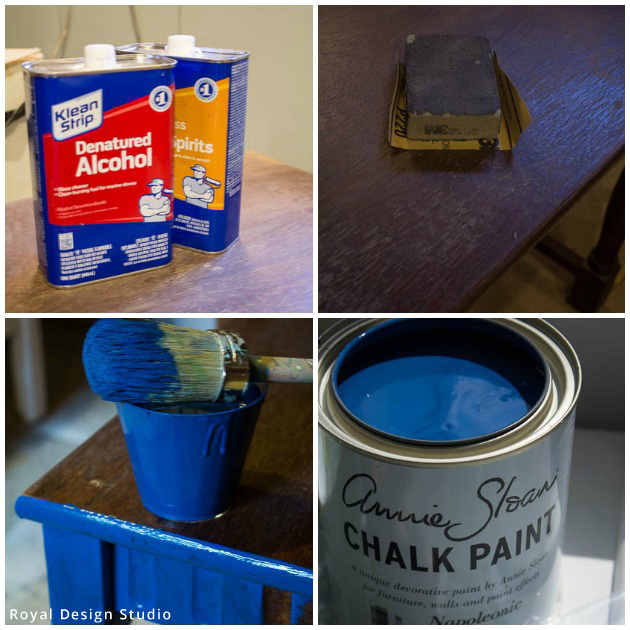 Paint the tables with Napoleonic Blue Chalk Paint® in as many coats as needed to cover. These tables required three coats. Wait for the paint to dry completely before beginning to stencil. 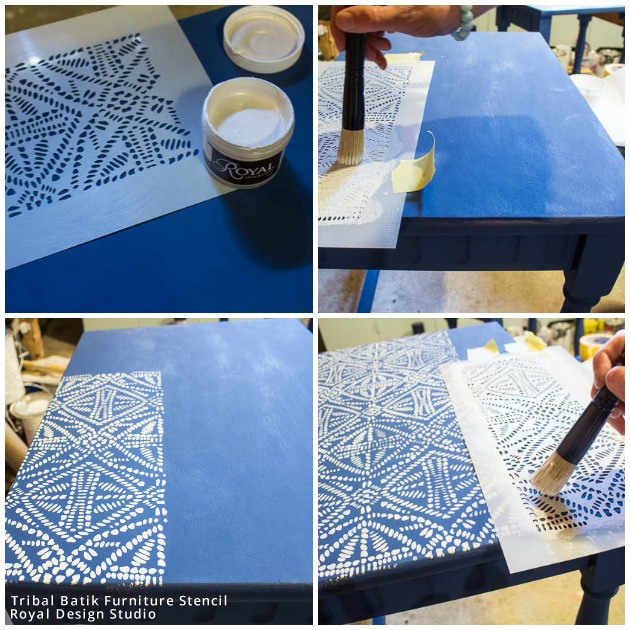 Align the Tribal Batik Furniture Stencil to the edge of the table and secure with painter’s tape. 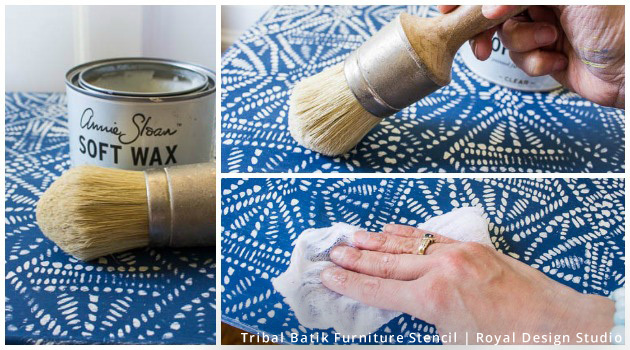 Be sure to off-load excess paint on paper towel to prevent it from bleeding under the stencil. This technique is called the dry-brush technique and you can learn more about it on P+P’s Basic Brush Stenciling blog post. Once done move the stencil over, align the pattern and repeat the process so as to cover the entire surface of the table. I decided to stencil each table top in a different color: the largest table in custom white mix (a mixture of Pure White and Old White), the medium in Paris Grey and the smallest in Pearl Oyster Stencil Creme. 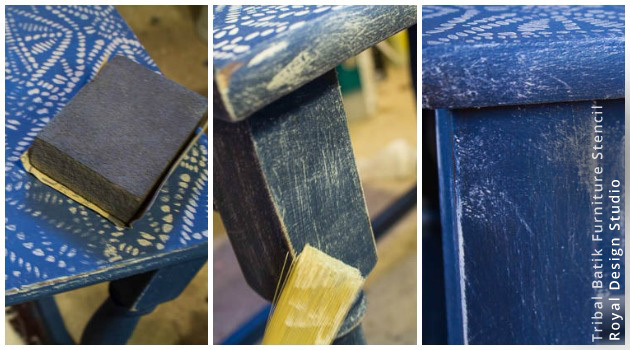 To create a time worn appeal, distress each table with fine grit sandpaper on the top and edges. 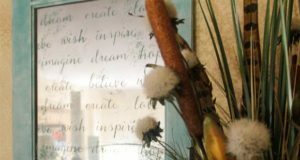 Dry brush the custom mix of white paint and pearl oyster stencil crème to complete this time worn look. Once dry, seal with clear wax and wipe off with cheesecloth. 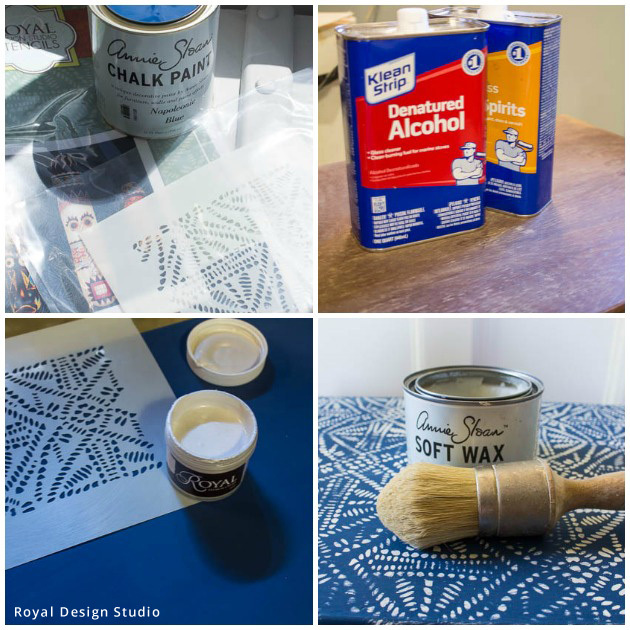 When stenciling, mix the swirling motion with stippling to get a distressed look. The shimmer of the stencil creme looks lovely with matte paint. It is nice to mix these different media together to add light and texture to furniture finishes. 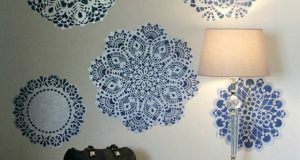 The Moroccan stencils are now available in mini versions. These are great on smaller crafts, or the tops of small tables (like the small one in this set). 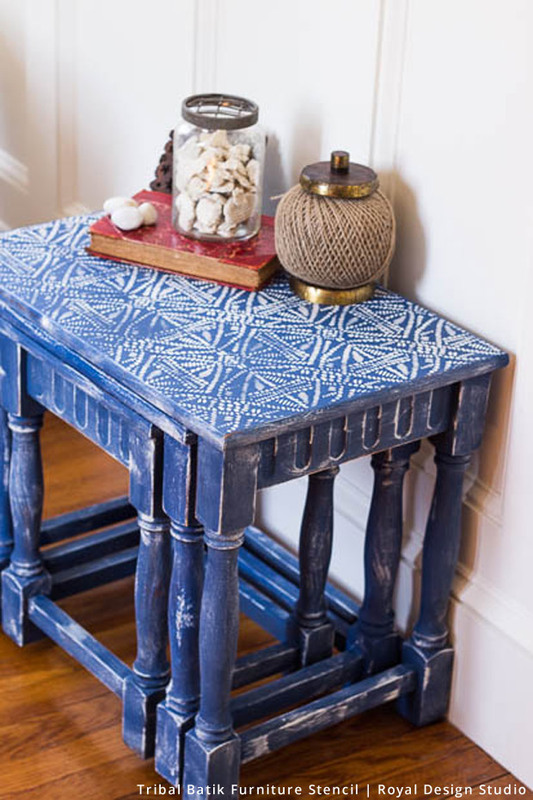 So, next time you see some dated nesting tables, you can simply revamp them with a can of your favorite paint and a fun stencil pattern from Royal Design Studio. Now these fab tables are ready for entertaining! Spread out or nestled together these tables make quite the statement in any home. 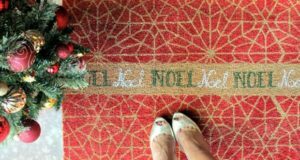 They by themselves are certainly traditional but addition of the stencil pattern and stencil creme give them a modern twist! These tables are absolutely gorgeous! I love the colour, and the bohemian touch is just fantastic! Well done Danielle!